Working for a nonprofit organization is no doubt a deeply rewarding endeavor. Often short on staff and short on resources, a nonprofit must also navigate the neverending drive to raise donations for their specific cause. Technology, however, is making it easier to overcome the hurdles associated with reaching your benefactors and generating those all-important funds. Let’s examine the most vital elements to building your support network and how to keep drawing in donations. Appealing for donations in the digital age requires a different set of skills than the more direct, in-person approach to which many charities are accustomed. Much like the advertising of for-profit companies, your pitch for donations must be compelling and to the point. How do you achieve this without the highly effective face to face appeal? Through the equally as effective landing page. Chances are you’ve encountered a landing page before. A useful online tool for both large and small companies, when a consumer arrives at a landing page, they begin the journey into an organization's marketing funnel. While the specific approach varies from group to group, the primary goal is to capture a prospect’s attention. Landing pages achieve this through a singular focus, or call to action, with the ultimate goal of directing the prospect to the purchase of a product or service. As a nonprofit, you can streamline your approach. There’s no need to lead your audience through a pitch process or promote the benefits of something for sale. As a charitable or cause-driven endeavor, the understanding of what you seek is already present. You do, however, need to appeal to your visitors enough to want them to help your organization. To be genuinely effective you must make your appeal dynamic and meaningful, but at the same time keep the message and call to action clear and uncomplicated. So just how do you create a landing page that appeals to a donor in a compelling, yet straightforward manner? Landing pages are made to achieve all manner of goals. For your nonprofit, this can mean fundraising, membership, or volunteerism. However, there is a throughline with the most successful of pages, and they all share some variation of the following elements. Regardless of your aim, the broad strokes will help you appeal to your audience and reach your goals. The critical factor is to maintain focus on the single call to action you’re attempting to invoke. We should note here that although we are highlighting donation based landing pages, these same principles apply to numerous forms of landing pages. As we just mentioned, to be effective, your landing page requires focus. Not just in your messaging and maintaining a singular call to action, but also in its design. To ensure a maximum donation, keep your content to a minimum. Only include the most vital of talking points or instructions. Don’t request more information than is necessary. Too much information or too many boxes and forms to fill out will sour your audience on what should be a feel-good experience and easy call to action. If copy is necessary to tell your story, keep it concise and on point. When using imagery (which we always recommend), only use one or two pictures. The photos should be both powerful and able to explain your cause with no words. The UNICEF donation page is a prime example of how to state your mission, use imagery to full effect, and keep the donation process simple while maintaining a singular focus. To recap, the landing page contains 30 words and one picture, and yet you know exactly whom you’re donating to and the purpose of your contribution. Individuals who donate to a cause want to ensure that their money is spent wisely and for its intended purpose. So show them with a graph. Graphs are a great addition to a landing page as they convey a ton of information without being obtrusive. This CARE page seeking donations for refugees in crisis makes effective use of two graphs without detracting from the simple, yet informative page design. What makes these graphs so useful is their conveyance of not only what the funds are for, but also the specific allocation. People chose your organization for a reason. Whether its a cause they have a direct connection with or a topic that draws their interest, donors want to be close to the organization that uses their money for good. Although landing pages accomplish engagement in several ways, one of the most effective methods is with a visual cue. Protect Our Winters aces the engagement test with stunning photography that would make any snow lover long for the mountains (or to help save them). More so than just the imagery, POW’s page also provides avenues for a contributor to learning more. From seeing the allocation of funds to links for their agenda and how to be a fundraiser, this example not only asks for donations but also involvement. Be mindful that this approach may not work for all nonprofits, and could detract from your primary call to action. However, if your target demographic is highly passionate about their chosen cause, the more engaging you make the landing page, the better. Single donations are great. Recurring donations though are indeed the gift that keeps on giving. Even with a concise, targeted message, always present your donor with the option to make their contribution a recurring one. Here Charity Water’s simple landing page presents a very straightforward option to contribute a single donation or to give monthly. Beyond the option to generate more than a single donation, landing page design should look to take advantage of special events. Whether it's an internal organizational directive or part of a broader, more public call to action, latching on to a collective effort can increase your social reach. For example, this page from the Leukemia and Lymphoma Society draws on Giving Tuesday, the national day of giving. This page is an excellent example of how to create a social media tie-in, with #GivingTuesday having prominent placement on the page. As we’ve explored the design and messaging of the nonprofit landing page, we’ve made mention of a vital component multiple times - the actual donation. Even with a well-designed page - beautiful imagery, succinct and informative copy, a clear call to action - if the formatting and payment process is cumbersome or not easy to follow, you risk losing a donation. More importantly, you risk losing a donor. It’s why keeping this aspect of your landing page at the forefront of your design is absolutely critical. Let’s revisit the Charity Water page, which stands as one of the most effective landing pages of any nonprofit. We’ve already touted the simplicity of their form. Even better is they maintain the uniformity for the whole process. Clear and easy to follow, the form is even able to subtly offer multiple payment methods without leaving the main engagement window. Similar to Charity Water, the below landing page from Covenant House, a shelter for homeless children, provides an equally smooth donation interface. Even with all of the form prompts on a single page, the process to give is easy to follow with minimal input required by the user. One other element that the Covenant House does very well is defaulting to and highlighting the option of providing a monthly gift. Again, a subtle prompt goes a long way to maximize your donations. Running a successful nonprofit is dependent on many things, none more so important than a vibrant foundation of donors. Maximizing those donations involves reaching those willing to contribute to your efforts. And where those individuals are is online. Which suggests that’s where you should be too. 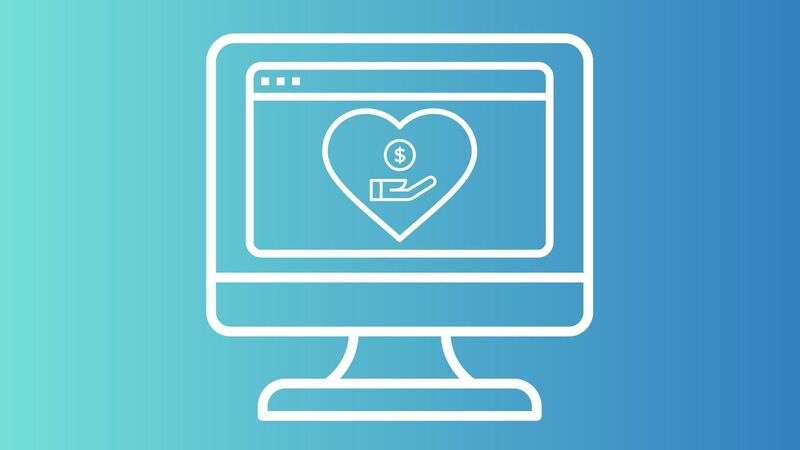 In creating a simple, compelling landing page for donations, you help bridge the gap between donors and the cause where they want to contribute. Just remember a clear and focused message that is both transparent and engaging will draw in your audience. A natural pathway to contribute will help realize the generosity of your donor base. From children’s charities and churches to medical needs or environmental causes, no matter your nonprofit, your donor base is indeed out there. Building a great landing page will ensure you find them. Ready to start taking donations today? Our Donation Templates will help you get there fast!